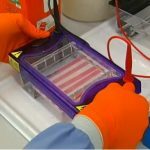 Cleaver Scientific reports that its horizontal electrophoresis equipment is being used on the frontline of the UK fight against Ebola. The Cleaver Scientific MultiSUB electrophoresis system features in a recent ITV report (www.itv.com/news/update/2014-10-10/government-defends-ebola-screening-plans/) on UK Government plans to step up Ebola screening of passengers arriving from West Africa at Heathrow and Gatwick airports as well as major rail terminus. At the Porton Down research centre in Wiltshire, UK – scientists are working on detecting and minimising the risk of the Ebola virus appearing in the UK. Currently researchers are analysing 10-15 blood samples / week taken from National Health Service (NHS) patients, all to date have proved negative for Ebola.